Aspen Pet Flecked Plush/Solid Pets love a good place to rest their heads. Now, pets can rest comfortably & pet parents can rest easy, knowing that good pet beds are more affordable than ever! 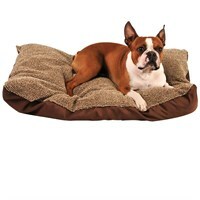 All beds have a high-loft polyester fiber fill that will make your pet feel like he?s on cloud nine. The bed has a comfy plush top & a solid poly-oxford bottom. Available in Golden Brown Plush with Espresso Solid, or Grey Plush with Black Solid. The removable cover is machine washable for easy care.